Properties for sale in Brittany, France - AHIB-3-mon1922 Loqueffret 29530 3 bedroomed house with 986m2 garden, another house, garage/workshop and 2 other outbuildings. 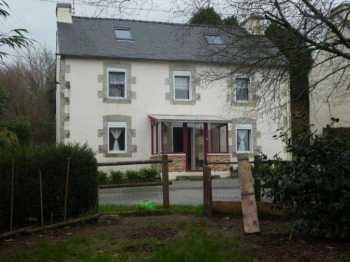 Located in the heart of hamlet, this renovated house dates from the late 19th century. Entrance into the conservatory onto a large living room of 43 m² with fireplace and pellet stove, WC. Fitted and equipped kitchen, bathroom (shower and bath) with WC, boiler-utility roon. On the first floor, mezzanine and two bedrooms (one leading to another). Attic with mezzanine and another bedroom. This house offers 120 m² of living space and is bright and airy, pleasantly south facing. In front of the house, an enclosed garden with a very old house (to renovate eventually) and a garage-workshop of 45 m² with parking. And 20 metres, 2 outbuildings in good condition, for storage and a garden of 300 m². Some painting and a little redecoration to be expected. This house, with economic heating is very well insulated. Double glazed doors and windows. A well priced property... not to be missed.